Frogs and toads are outstanding indicators of water quality and environmental change, and many species in Connecticut and beyond are showing clear signs of trouble. 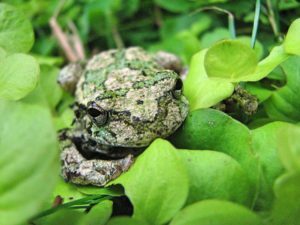 Come to Great Hollow on May 4th to hear a presentation by our naturalist, John Foley, on the 11 species of frogs and toads that call Connecticut home. We’ll learn about the important roles that frogs and toads play in their ecosystems, fascinating facts about their life-cycles and behaviors, and how to tell all of these different species apart both visually and by the sounds of their mating calls that are so characteristic of spring and summer nights in our area. We’ll also discuss the diseases and other factors that are currently threatening frogs and toads around the world. A suggested donation of $5 per person is greatly appreciated for this event. We also appreciate advanced registration; to sign up, please email John at gro.w1555591031olloh1555591031taerg1555591031@yelo1555591031fj1555591031.